In preparation for the 2017 U20 World Cup in Korea the Canadian Soccer Association has assembled a group of players born in 1997 or later under the management of Coach Rob Gale. The eight day training camp will take place at the Toronto FC KIA Training Ground and includes the players attending Canada's senior men World Cup qualifier against Belize. It is important for Canada to have these events, as not only it makes the CSA aware of Canada's top players at these age groups, but it also provides motivation for the player to be committed to the Canadian cause. In the United States, this is a regular occurrence as young as U14 and probably is one of the reason Brampton resident and TFC Academy player Ayo Akinola is currently playing with the US National Youth Team oppose to being on the list of players invited to this camp. Added to having these camps, it's also important that the Canadian Soccer Association are aware of the top players at all levels of the game across the country, and players who qualify as Canadian playing across the World. Recent efforts by @Canucks_Abroad has done excellent work in terms of listing all Canadian players playing outside the country, including updating recent efforts by Canadians on their twitter account. My own view is this needs to include all domestic playing Canadians at a much younger age group. This will help create awareness of players playing across the country, but also further analysis can be done to help develop the player into a useful asset for the Canadian youth and senior setup. It can also help the players own development and can lead to further opportunities professionally here, in Europe, or the chance to play at American University on scholarship. With what information is available, I have attempted to develop a database on my own covering Men's and Boy's Elite soccer, and have developed a database of over 20,000 players across the country through resources on the internet and contacts I have in the game. Based on my work, by far most organized soccer association is Quebec, where I been able to collect data from the U14 level all the way to college, university, and the new Quebec semi-pro league PLSQ. Ontario would be next and I have data from the OYSL and CSL, although still need to add information from the Academy League and League One Ontario. I have also been able to get information from other provinces, including Manitoba and Nova Scotia, although outside the Whitecaps USSDA program I haven't found any information from BC. It must also be said the information I found has only been basic data such as games played, goals and disciplinary record and I feel it is important other information is collected such as minutes played, assist and shots on target to allow for further analysis. This would be inline with the profiles we are doing on ProspectXI for mostly American prospects that has vital information and added assessments from coaches and evaluators. With the information currently available there are interesting stories regarding the players selected for the U20 training camp. While I wouldn't say any player selected is the sure thing, there are a number who have good potential upside and players who should be followed closely over the next few years. There are a few missed players that come to mind, and I would list MLS Academy players such as the Montreal Impact’s Luca Ricci, Vancouver Whitecaps’ Terran Campbell and Toronto FC’s Kevin Tamachy, who were part of the U16 training camp a year ago and have had respectable seasons this year playing against good opposition. The other name I felt was left out is Glorie Amanda from Edmonton who plays with the Whitecaps Residency program and scored 15 goals in 23 games for the Whitecaps U15-U16 USSDA club. 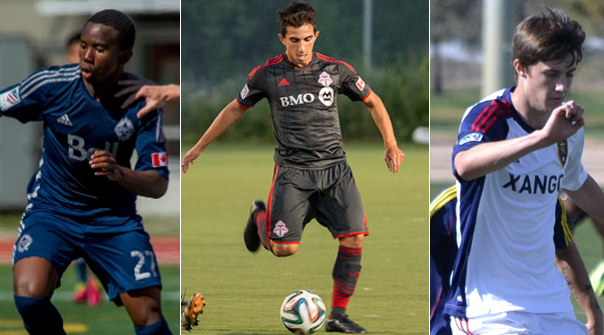 Of the players selected, Luca Uccello is the highest profile after he quickly moved up the TFC Academy ranks. After starting his soccer playing with Klienburg-Nobleton, he now is a regular on Toronto FC II in USL playing in 17 games, starting 13 games in the midfield contributing an assist and four shots on target. Arguably, he is playing against opponents too experienced, although without Toronto FC having a USSDA team, USL and PDL were the best options for him and to his credit he has been picked ahead of some players five years his elder. The three other names that probably stick out to people looking at the list are players who are currently playing in England. Such as Manchester United's Joshua Doughty, Fulham's Harrison Patton and MK Dons Elliot Simmons. Josh is a very interesting player mainly for the fact he is playing for Canada. The 18 year old winger’s parents are British and moved Josh to Arizona at a young age. Before moving to Man United he played on one of the top MLS academy teams in Real Salt Lake Arizona and played two USSDA seasons with the U16 club playing in 58 games and scoring 17 goals. Doughty has yet to make appearance for United and is expected to play with the U18 or U21 Academy team this season. Paton played with Kitchener in OYSL until the age of 16 before moving to London trying out with Brentford and QPR before signing with Fulham. Since Fulham has been relegated from the Premier League their Academy has been in a bit of disarray, although if Fulham continues to struggle it could give Paton first team opportunities with the Championship club. Simmons has been in England for a number of years and actually no longer plays for the MK Dons Academy and as far as my records show he is currently unattached. Uccello, Doughty, and Paton all have potential for being influential in the midfield, although the players who interest me the most are the forwards. Daniel Sagno and Aymar Sigue were both regulars with the Vancouver Whitecaps USSDA teams with Sagno scoring 25 goals in 63 games including 16 goals during the 2014-2015season. While Sigue currently plays NCAA Division 1 soccer at Tulsa going into his sophomore season, and the 6'2/185 forward scored 16 goals in 45 games with the Whitecaps USSDA U16 team. Meanwhile, the two other forwards invited, Montreal Academy player Badreddine Boulajoul and League One Ontario, ANB Futbol, Adonijah Reid have burst on the scene with recent success showing great goal scoring ability. Boulajoul had a good youth career in Quebec, but gained attention scoring 39 goals in 23 games with Monteuil in the Quebec U17 elite league before being signed by the Montreal Impact U18 USSDA club where he scored 12 goals in 12 games helping the Impact finish as one of the top clubs during the 2014-2015 U18 season. Adonijah Reid just turned 16, but has played games in League One Ontario the last two years, including the league leading goalscorer, already scoring 18 goals this season. Ried is another player from Brampton with great potential and before his success in League One Ontario trained with France Ligue 1 club OGC Nice. The invitees include three Toronto FC Academy players in Gabriel Boakye, Marcus Godinho, and Tristan Borges. Boakye a defender and has progressed from the last three years from OYSL soccer in Richmond Hill to Toronto FC Adacemy playing OYSL, L1O, PDL and made his professional debut with Toronto FC II and has played 8 games this season in USL. Godinho a fullback who has also moved through the TFC ranks since joining the Academy from Klienburg-Nobleton in 2012. Like Boakye he has played both PDL and 5 games Toronto FC II this season, but both have yet to sign a professional contract. Tristan Borges, who was one of the highlights from the U17 World Cup team including his goal against Mexico, has signed on with SC Herenveen this summer but has yet to join the Dutch club. Borges played with West Toronto in the OYSL before joining TFC Academy last season. Outside of Sagno and Sigue there are three other players from the Whitecaps USSDA program including defenders Quinn Bredin and Kadin Chung as well as midfielder Vana Markarian. At fullback, Chung has the most experience with the USSDA program playing in 63 games with the U16 team and scoring 2 goals. Markarian, who is from Ottawa, can play a holding midfield role or central defender with good size and has played 35 games with the U16 team. While Quinn tried his luck with many European academies before returning to Canada and played 11 games with the Whitecaps U18 USSDA team this past season. The Montreal Impact have the most representatives with six, including Boulajoul, others including Goalkeeper James Pantemis, Defenders Mouhamed Toure, and Thomas Meilleur-Giguere and Midfielders Pierre Lamothe, and Tabla Ballou. Lamothe has the most experience playing club soccer with Longueuil before joining the Impact Academy in 2012 and has played 35 USSDA games at the U16 level and played 22 games with the U18 team last year in a key role with the club including scoring five goals. Thomas Meilleur-Giguere played with L'Assomption including a game in the PLSQ as a 15 year old. He moved to the Montreal Impact and played 24 USSDA games at U16 and 19 games with the U18 team this past season including scoring five goals. Toure recently signed with the Montreal Impact program and played 17 games with the U16 USSDA games in 2014-2015, but also included on the U16 National Team call up with Boayke and Chung to play at the Montaigu Tournament in France last April. Ballou is listed as a wide midfielder but known in Quebec for being a forward including 29 goals in 20 games with Panellinios in 2014 at the U15 level. Ballou played in seven games with the Montreal Impact USSDA U18 team and scored five goals. While Pantemis played four years with Lakeshore in the LSEQ before joining the Impact U18 USSDA team as the backup keeper playing in 7 games this season. The team also includes three FC Edmonton Academy players in goalkeeper Christian Kaiswatum, and Midfielders Thomas Shores and Shamit Shome. All three train with the FC Edmonton senior team but also lay with the St Albert Impact in the Edmonton United Premier League and so far this season, although have been outclassed by Edmonton Victoria in that league. Alberta is another association that is difficult to find information for outside of standings and leading goalscorers. Although it is good to see FC Edmonton being recognized and it is a surprise that the Ottawa Fury II who play in the PLSQ do not have any invitees. The final two invites are Marvis Kreitling, a goalkeeper who originally played in Winnipeg and now plays in Germany with TSG Sprockhovel after playing with Niendorfer TSV last season. Sprockhovel does play in the Jugend Bundesliga West against clubs such as Beyer Leverkusen and Borrussia Dortmund, which should give Marvis good experience. While Yuri Ruh Dos Santos nicknamed "magic feet" has had a very interesting soccer story having trials with West Brom, Stoke City, Getefe, and his current hometown of Marbella, Spain, although recently transferred to AC Trencin in Slovakia. The exciting aspect in terms of Yuri's development is not only is he expected to get first team games, Trencin is a feeder club to Ajax in Netherlands which could lead to exciting prospects if he performs. Why I say none of these players are the sure thing comes from my awareness of thousands of player from other countries within the same age groups and how players at 17-18, and even younger, are not only establishing themselves as talent but are also being purchased at million dollar transfer fees. I will say I'm not an expert regarding youth soccer and this is only something that I recently started to explore and I'm sure the CSA made good choices in terms of their selection. I'm also sure there are people involved in the Canadian game who have a much closer relationship with youth soccer in Canada and could give more detail assessment and add players to the list. Aaron Neilsen is a co-founder of Prospect XI (Prospect Eleven), a scouting network and online magazine dedicated to tracking/highlighting young players that refer to as "prospects" as well as their development pathways both within North America and worldwide. Follow PXI via www.propsectxi.com or on twitter @ProspectXI.